No matter when you’re visiting Greater Madison, don’t forget to bring your bike! Our miles and miles of trails have some of the best views in Greater Madison during summer and fall, but biking enthusiasts see the snow and cold as a cool challenge—from the moment the flakes start to fly all the way through the end of winter. 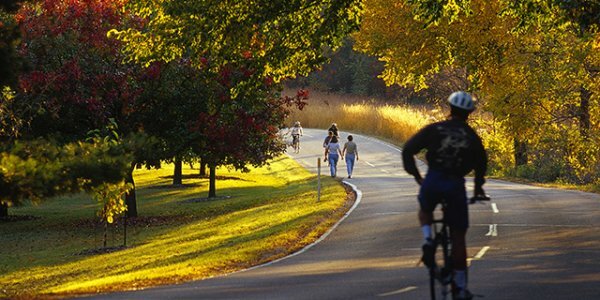 Our residents are active because neighborhoods contain well-maintained networks of paths that make biking fun. While in town, explore like a local and take the UW-Madison Arboretum trail—discover local flora and fauna, and end your day on nearby Monroe Street, an inviting and quaint neighborhood home to local shops and restaurants. Or, start your day at Olin Park and loop around Lake Monona. Don’t forget to stop at Monona Terrace, take the bike elevator and see the amazing city views. Madison is the unofficial bike capital of the Midwest and boasts more bikes than cars. In recognition of the city’s efforts, the League of American Bicyclists bestowed Madison with Platinum status in November 2015. Only four cities in the U.S. received this honor, and Madison is the sole city east of the Mississippi River. The surrounding communities of Fitchburg, Middleton, Monona and Sun Prairie also received accolades by the League. In addition, the Wisconsin Bike Federation also honored Madison with platinum status as a bicycle-friendly city. What does this mean for visitors? A safe and fun place to bike! Riding in the city is not only acceptable, it’s accessible. For example, tool around downtown with the help of Madison BCycle, the city’s urban bike-sharing program that makes it convenient to get around Madison on a bike. 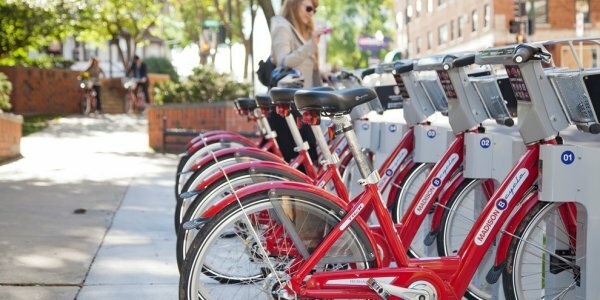 BCycle has 40+ stations across the city and renting is easy through their check in/out program. Some of their sites are also open during the winter months. 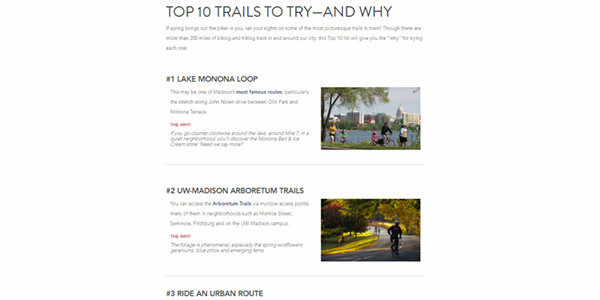 Bicycling.com, one of the nation’s top cycling websites, considers Madison one of the nation’s top cycling cities! The website cites the IRONMAN Wisconsin bike course as a reason why Madison rose to the top. You too can be a (partial) Ironman by riding “one of the toughest bike courses in the U.S.,” which winds through pastures and hilly terrain. It may be best to check out the bike course beforehand. USA Today also compiles a ranking of America’s greatest cities for cycling and gave Madison fourth place. Kudos went to Madison’s mountain biking opportunities, such as single track at Cam-Rock Park, 25 minutes outside of Madison. Other off-road options include Devil’s Lake, Badger Prairie Park and Quarry Ridge. You can rent mountain bikes, gear, helmets and more at Machinery Row Bicycles, which is right on the Lake Monona bike path. If you’re going to bike anywhere on Earth, why not choose Madison? It is one of the "Best Places on Earth to Bike" according to Yahoo Travel, along with other amazing cities like Amsterdam, Copenhagen and Montreal. This recognition is due in part to city trails commuters and visitors use to traverse the city (even in winter on fat bikes). More than five percent of Madison residents commute by bicycle, utilizing 75 miles of bike paths. When in town, ride by the Monona Terrace and check out the city’s Bike Barometer, which displays the daily and yearly count of bicyclists. 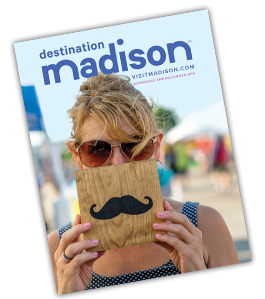 From our designation as a platinum biking community, to the more than 200 miles of trails available, there are numerous honors—and adventures—to have in Greater Madison. Learn more about our trails by visiting the City of Madison web site and plan your cycling adventure today!